With the approach of late summer and the possibility for lower nighttime temperatures, this is the time when blanking can occur. Keep in mind how water management helps to mitigate this problem. Spikelet sterility, sometimes referred to as "blanking", occurs when the developing pollen grains are exposed to nighttime temperatures at or below 55 degrees F for several hours. Pollen is sensitive to low temperatures about 7 to 10 days after panicle initiation. The pollen is at the temperature sensitive stage when the collar of the flag leaf and collar of the previous leaf are aligned (Figure 1). While there are varietal differences in blanking susceptibility, in normal years, blanking is around 12 percent. 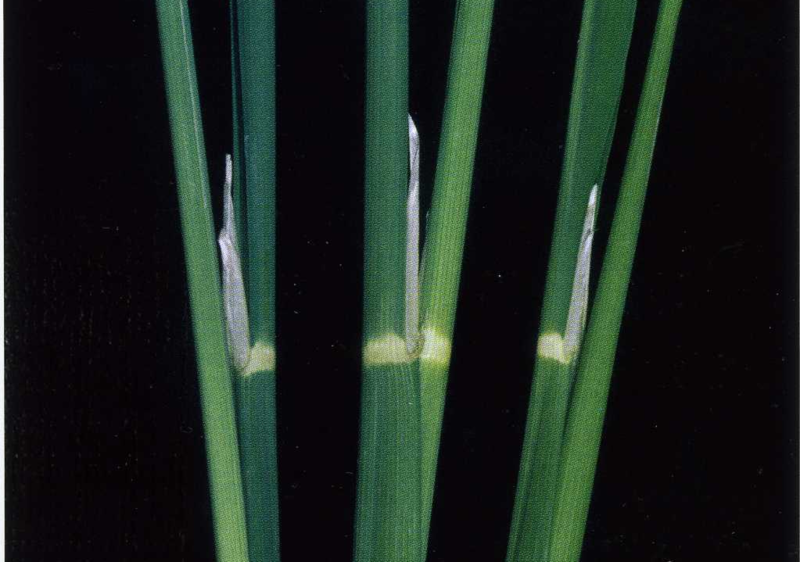 Blanking can be detected in the field about 10 days after flowering. The occurrence of translucent hulls when the panicle is held up to the sun identifies unfilled grain. Figure 1. The low temperature sensitive stage of pollen development occurs when the collar of the flag leaf and the collar of the previous leaf align (center plant in photo). Proper water management helps to mitigate the occurrence of blanking. About three weeks before heading, the base of the panicle is about 4.5 inches above the ground, and the tip of the panicle is about 10 inches above the ground. Raising the water level above the base of the developing panicle can help to reduce the incidence of blanking because the water acts as a heat sink. The minimum nighttime water temperature will be about 3-5 degrees F warmer than the minimum nighttime air temperature, depending on water depth. The warmer water temperature will also warm the air temperature immediately above the water level. In a 1980 paper, UC Davis researchers found that shallow water (3-4 inches) resulted in 22.2 percent blanking among eight varieties, whereas deeper water (6-8 inches) resulted in 17.8 percent blanking among the same eight varieties. Currently, we are recommending a water depth of 6 inches at 7-21 days before heading to help reduce blanking. Given drought concerns this year, we suggest that growers allow the flood water to subside naturally rather than drain the fields. In practice, this means that water flow into the field can be stopped well in advance of the drain date. How far in advance will depend on the amount of water already in the field, as well as soil and field properties such as percolation. Therefore, raising the water before heading does not necessarily use more water provided the water is turned off earlier at the end of the season. Variety and fertility management can also result in varying amounts of blanking. Varieties that tend to have lower levels of blanking have true genetic tolerance to cooler temperatures, and they generally are shorter in stature and mature early. High nitrogen rates may increase blanking by increasing vegetative growth and delaying heading. The increased vegetative growth draws away sugars that the plant would otherwise use to fill the grain. Keep in mind that different varieties and fertility practices could result in neighboring fields reaching the susceptible development stage for blanking at different times. Different varieties and fertility practices could result in neighboring fields that were planted at about the same time being more or less susceptible to low temperature events, therefore, resulting in different levels of blanking. Unfortunately, blanking is not like thinning fruit trees – it does not result in larger grains where grain forms. A 1972 UC Davis study showed that panicles do not compensate for high blanking by producing larger grains. In fact, the study showed that grains from high-blanking panicles had weights that were 3 percent lower than grain from panicles where blanking was low.